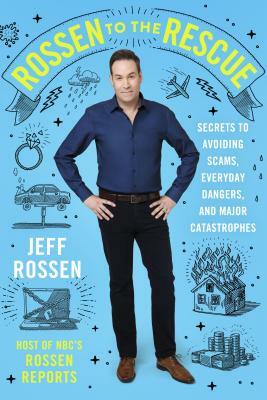 Every morning, millions of Americans watch Jeff Rossen explain how to solve our most harrowing problems, such as: how to put out a kitchen fire, find bedbugs, avoid rip-offs, and even how to survive a plane crash. In Rossen to the Rescue, he includes daring experiments, expert advice, and game plans for handling all the wild cards in life—big and small—while sharing personal, and sometimes embarrassing, anecdotes that he couldn’t tell on television. Overflowing with never-before-seen tips and tricks, this book is filled with enough hacks to keep you and your family safe…and it just might save your life. Jeff Rossen began his broadcasting career as a teenager in radio before making the transition to local television as a reporter. He earned an Emmy Award for “Deadline News Writing,” an Edward R. Murrow Award for his work covering the September 11th attacks, and has also received an award from the U.S. Justice Department for his special reporting on crime victims. Jeff Rossen joined NBC News as a New York-based correspondent in September 2008 and was named National Investigative Correspondent in 2012. He contributes to all NBC News programs and platforms including TODAY, NBC Nightly News, MSNBC, NBCNews.com, and the network’s mobile properties. Jeff is the author of Rossen to the Rescue. "Rossen to the Rescue is filled with invaluable ideas and information on everything a family needs to know. From protecting your home and children to survival techniques. I know EXTREME and this book is a simple and EXTREME guide to everyday living." "Knowledge and experience takes years, but Jeff gives you the Cliff Notes!" —Libby Rector Snipe, Rail Safety Expert at Operation Lifesaver, Inc.
"Rossen to the Rescue is the user manual for everyday life we’ve been missing. Much like a Swiss Army knife, this book is a useful tool for everything from how to avoid a scam to how to protect your kids. Rossen captures the spirit of his popular Rossen Reports onto the pages of this smart, accessible how-to-guide."